A Huntington Beach surfer was transported to Hoag Hospital in Newport Beach on Monday after sustaining what lifeguards explained was the most serious sunburn they’d ever seen. Tyler Callahan, 22, was surfing the north side of Huntington Beach Pier Monday morning with his friend, Sam Fox, 22, for several hours until Fox yelled to Callahan he was going to take a wave in. Fox waited for his friend on the sand for over thirty minutes. “I was worried about getting to work on time, so I waved to him and left,” he said. One hour turned to two, two turned to three, but still, not a single wave came to Callahan. Local lifeguard Buzz Kenworthy, 35, says he watched Callahan’s plight and saw him splash the water on numerous occasions out of frustration, but didn’t think to make a rescue. “I can’t understand for the life of me why the kid didn’t just paddle in,” he said. By 3 p.m., six hours after his initial decision to catch a wave, Callahan managed to muscle into a closeout then flop to his belly and ride to shore. “It wasn’t the wave that I wanted, but it did feel good to catch something,” he said. When he got to the beach, though, he felt light-headed and his face and neck were painful to touch. Kenworthy stopped Callahan and began to treat the burn, but ultimately Callahan was transported to Hoag Hospital’s emergency room for further treatment. 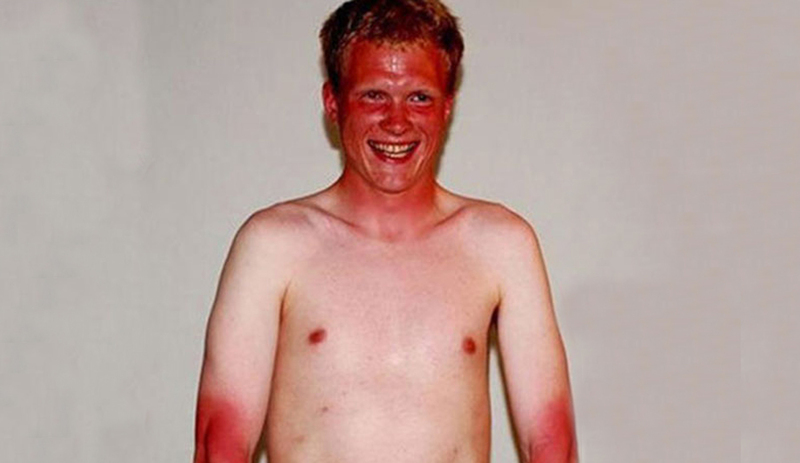 “That was the worst sunburn I’ve ever seen in my life,” Kenworthy said. Despite the severity of the burn, physicians are confident Callahan will make a full recovery.